At age 16 Dewey Knight was a coach and player for the Nashville High School baseball team of 1914. A son of Jonathan Perry Knight and Ada Parrish, he was born at Rays Mill, GA (now Ray City) on May 1, 1898, but grew up in Nashville, Georgia. Team mascot Lucius Eugene Griner was a son of James B. “Jim” Griner, who would later serve as Police Chief of Ray City. Nashville High School Nine. 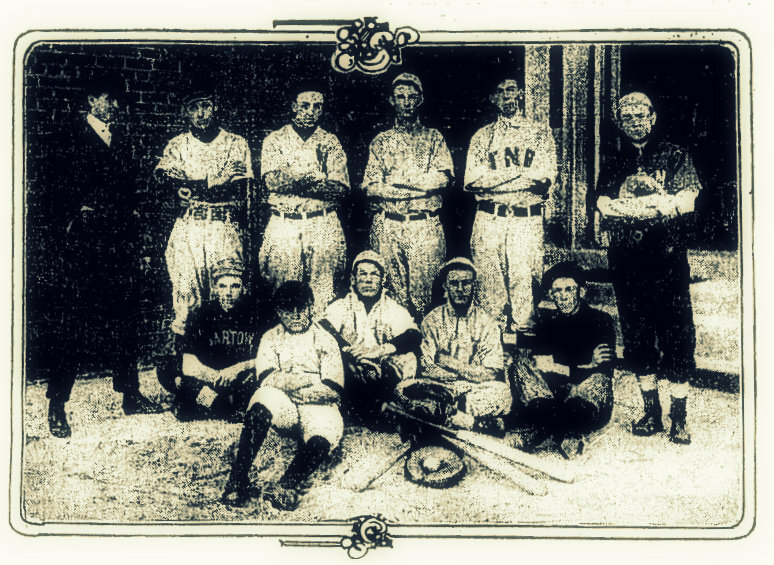 The players in the photo are, left to right: Standing, Dewey Knight, Sub and coach; Noble Hull, pitcher and manager; Emory Gary, first base; Robert Hendricks,second base; June Norwood, short-stop; Willie Peeples, catcher and captain. Sitting: Homer Connell, center field; Lucius Griner, mascot; Basom Webb, left field; Hobart Alexander, third base; Alvah Webb, right field. Nashville, Ga., March 7. – (Special.) The Nashville High school ball team was organized Friday, February 12. The boys elected Noble Hull manager unanimously. Willie Peeples was made captain of the squad, while June Norwood will be treasurer. The school heretofore has not had an organized ball team, and there it is very evident that it will make a “hit” with the school as well as the surrounding community. The teachers have all pledged themselves to do all they can for the maintenance of the organization financially and otherwise. The team is preparing a play from which the proceeds will go for the support of said team. Other measures of obtaining funds have and will be resorted to. The boys work together “better than any bunch that have ever worn Nashville uniforms.” They are all about the same size and are capable of understanding each other magnificently. The boys of said team claim that they are “unbeatable” by any high school team of south Georgia. Beginning with March 14 the boys challenge any high school for one or three games.